Leinster Rugby have today confirmed two further appointments to the senior coaching staff for the 2015/16 Guinness PRO12 and European Rugby Champions Cup season. John Fogarty has been promoted from Elite Player Development Officer to the role of provincial scrum coach after the departure of Marco Caputo, while former Leinster captain and defence coach Kurt McQuilkin will re-join the province on a short term contract as defence coach. Confirming their arrival Leinster Rugby CEO, Mick Dawson, outlined the reasoning for the appointments two weeks ahead of the start of pre-season training. "Top of the list was a need to put in place the resources to support Leo in his role as Head Coach and indeed Dan Tobin as Head of Fitness for the pre-season programme that they have planned. With Marco Caputo no longer here with us at Leinster and Richie Murphy being with Ireland as they prepare for the Rugby World Cup, there was always going to be a need to recruit and to recruit well ahead of the season. "We believe that we have done that and in John and Kurt we have two coaches who understand what it takes to be a Leinster player and a successful one at that. They have also impressive coaching CVs and are very well respected within Leinster. Fogarty, who won a Heineken Cup with Leinster in 2009, played a total of 160 professional games for Munster, Connacht and Leinster and was capped by Ireland in the tour to New Zealand in 2010. 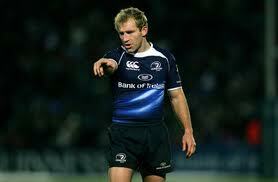 He retired later in 2010 but was subsequently retained by Leinster as an Elite Player Development Officer. He worked as forwards coach for the Leinster 'A' team that won two B&I Cup titles in 2013/14 and 2014/15 and is currently in Italy with the Irish Under 20s also as a forwards coach. McQuilkin is also a former Leinster player and captain and was also a defence coach under Michael Cheika and was part of the backroom team that brought a first ever Heineken Cup to the province in 2009. The former Lansdowne FC club man who played 32 times for Leinster and was capped five times by Ireland in the mid-nineties, will join the club in time for pre-season training which starts on Wednesday the 1st July. Another appointment confirmed today by Leinster Rugby was that of Shaun Berne as Elite Player Development Officer. Berne, who played 23 times for Leinster from 2009-2011, will replace Wayne Mitchell who is moving to the UK.